UNITED NATIONS, January 5 -- Following what representatives of the targeted Murle community call "ethnic cleansing" not stopped or even opposed by UN peacekeepers in Pibor in South Sudan over last weekend, the head of UN Peacekeeping Herve Ladsous spoke Thursday to the Security Council then the press. Citing reports that UN Peacekeepers did not even try to stop 6000 advancing Lou Nuer as they approached the town of Pibor, but rather urged the Murle to flee out of town where many of them were killed, Inner City Press asked Ladsous what happened to the UN Mission's "protection of civilians" mandate. Ladsous said, "We do what we can with what we have." Video here, from Minute 1:33 (incomplete UN audio). While the numbers are smaller here, to some this resembles what the UN said during and after three months of ethnic slaughter in Rwanda in 1994. Inner City Press asked Ladsous if media reports and headlines that the UN urges Murle residents to flee were false. Ladsous, off camera, said "we operate a system of early warning," and claimed that it was entirely up to the residents whether to stay or go. Again, echoes of Rwanda. As Inner City Press raised on Ladsous' way in, and as since noted by others, Ladsous spoke in the Security Council for France about Rwanda during the genocide in 1994 as the French Deputy Permanent Representative. After Thursday's Security Council meeting, at which for a variety of reasons UN Peacekeeping was not called to account even as it was for example after inaction during a spree of rapes in Walikale in Eastern Congo, one Council member told Inner City Press that "the reports of UNMISS to flee and those fleeing getting killed are troubling." Another discussed the similarities with Rwanda. So why didn't and don't the Security Council members hold DPKO accountable? Several Western members have been fighting to reduce costs in peacekeeping, even in missions in inter-state conflict zones like Abyei, so they are reluctant to publicize deaths that result from lack of resources. Other Council members are big troop contributing countries and would not like their contingents called to account for mistakes. Others still, including the post-meeting drafter the United States, support the Government of South Sudan so much that they do not want to highlight any failure by the GOSS to protect civilians, or worse. And so there is a loophole, and no accountability. After all other Council members had left, this month's Council president Baso Sangqu of South Africa told Inner City Press there is some discussion expected in DPKO of "lessons learned." He did not answer if this would ever be public, but said that "the Americans" are draft something in response to the morning's briefing. And that was it. Footnote: at the end of Ladsous too-rare stakeout, Inner City Press asked him again if DPKO had yet signed a Status of Forces Agreement for the mission in Abyei. 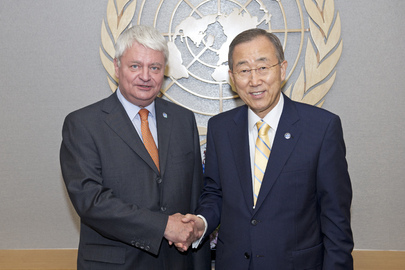 In November, in his last stakeout, Ladsous told Inner City Press that such signing was immanent, before refusing to answer a still unanswered questions about DPKO's and MINUSTAH's response to the charge they have no standing claims committee regarding UN peacekeepers' alleged introduction of cholera into Haiti. Now, despite the fact that a lack of a SOFA for Abyei played a role in the bleed out death of peacekeepers there who stepped on mines and couldn't be promptly evacuated, DPKO has still not signed a SOFA for UNISFA. Inner City Press on Thursday asked, what's the hold up? "No particular hold up," Ladsous said. So this DPKO arguably cannot or will not protect civilians, for example in South Sudan -- and now won't even protect the peacekeepers serving in blue helmets, as they continue deployed without a Status of Forces Agreement impacting medevac and other issues. Watch this site.